For two different challenges today – Queen for the Day (Marie) and the Free For All (to use stripes). I chose to make a center step card today. There are lots of tutorials on the internet for center step cards…here’s one from Splitcoast. I used a smaller version so that my card would fit in a standard A2 envelope. The image was stamped in Concord Crush on Whisper White and then die cut. I then stamped the same image several times, again on Whisper White. 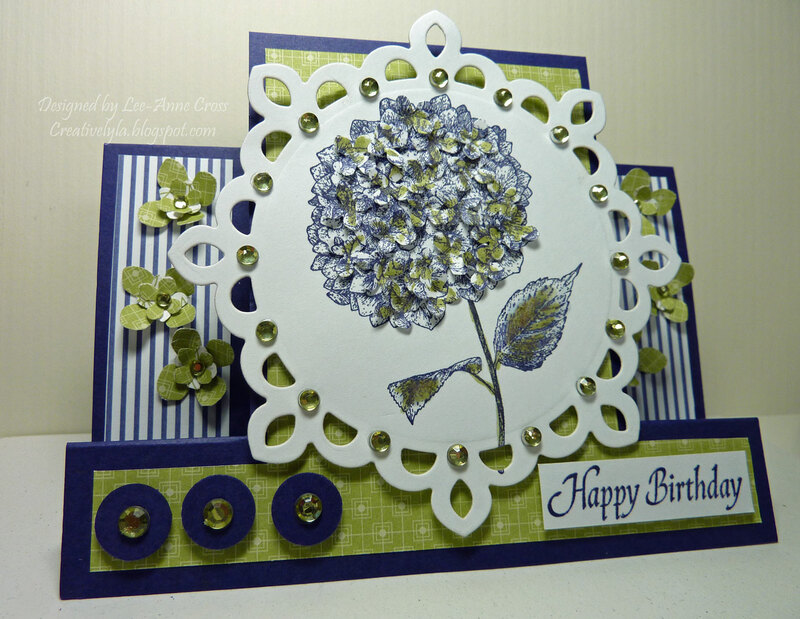 Next, I used the Martha Stewart Hydrangea punch and punched a whole bunch of hydrangeas from the stamped images. Next, I took my Pear Pizzazz marker and added a touch of color to each of the flowers. Then, I used my stylus and the soft pad from the Mat Pack to shape each of the flowers. Next, I assembled the three layers of each hydrangea and glued them in random order on the large stamped image. I used my blender pen and the same marker to color the leaves. Finally, I added some gems to the main image. Beneath the main panel, I cut a piece of designer paper about 1/4″ less than the upside down “t” shape of the panel. The die cut was popped up on dimensionals for interest and so that the die cut doesn’t get caught on the flowers on the side panels. The green hydrangeas along the side panels were created in a similar fashion, except I didn’t add color with a marker. I simply varied the designer paper pattern for interest (i.e. used the back side of the two-sided paper for one layer of each flower). Again, I added a gem to the center of each flower. Each side panel has a striped layer of designer paper too. Then, I used a circle punch and larger gems for the circles on the bottom left of the card and simply stamped the sentiment in Concord Crush on a small rectangle of Whisper White. I love this color combo – Pear Pizzazz, Whisper White and Concord Crush – don’t you? Didn't know you had a blog but I saw it when I started to comment on this beauty on SCS. O.K., back over to to do that.